It rained. And rained. And, boy, did it rain. It wasn’t as dramatic as the big Atlantic storms are in Cadiz, seas breaking over the city walls, wind whipping the rain down the narrow tunnels of the streets, but it was still pretty unpleasant. So, what to do? 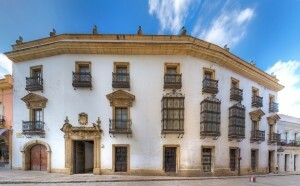 Well, Jerez isn’t short of things to see and do, especially if you’re a visitor and particularly during Festival time. There’s the wonderful Palacio del Virrey Laserna just near the castle, which I’ve written about before, or the exhibition space inside Alcazar itself – though the Alcazar is best seen on a dry and cloudless day when the Camera Obscura is operating. 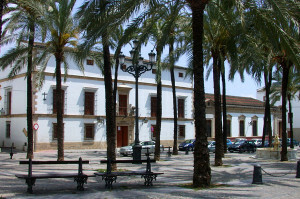 I have also written before about the Archeological Museum in Plaza Mercado, which is well worth a visit ( leave plenty of time, it’s quite a big museum ). The Real Escuela Arte Equestre is open most days, it’s Museum is both informative and interesting. I like to watch the students (both human and equine) training in the arena, or in the dressage square outside (though not in the rain). If you want to see the performance, check the web-site to see which day(s) of the week it is on. Of course the other, very unique thing about Jerez, is sherry – the city gave us the word – so the visitor can always go round a bodega. 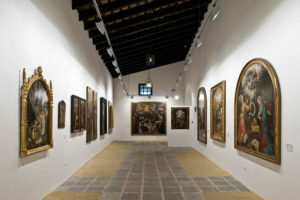 My favourite is the very high-end Bodegas Tradicion, partly because it contains an excellent art gallery, housing the owner’s private collection of Spanish paintings ( Goya, Velasquez et al ) and partly because I know folk who work there. But El Tradicion isn’t a ‘typical’ sherry bodega and it isn’t open every day (make appointments by phone if you want to go round). The two largest typical bodegas are Gonzales Byass and Domecq, the first originally Anglo-Spanish (Mr Byass was from Bristol), the second originally French, though Domecq has the distinction of being the oldest – just. If you don’t know how sherry is made, it’s worth going around one of these. On the middle Saturday of the Festival (when it poured) our party went around the latter. 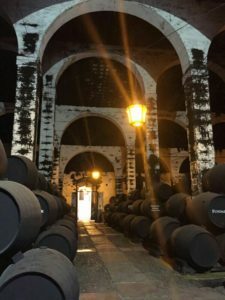 Sherry is a fortified wine, with alcohol added, so the bodegas are distilleries in a way that ordinary vintners aren’t, they distill the pure alcohol which is added to their wine. 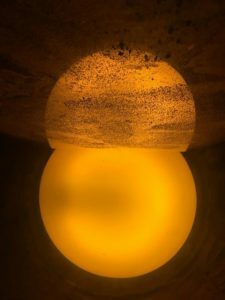 How that alcohol is added (and how much) and the point at which oxidation is permitted determines the type of sherry produced, from the pale fino to rich, dark oloroso. A tour of a bodega will tell you all you want to know about the method and the solera system of blending. And you get to try the produce. 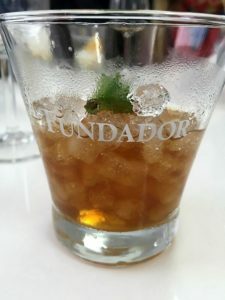 At Domecq this meant a La Ina fino (Gonzales Byass equivalent is Tio Pepe), a Harvey’s cream served ‘on the rocks’ and a Fundador Brandy mohito (recipe below, our tour guide was kind enough to go and print it out for us). Harveys had used to be a separate bodega and you can still visit it, but now it is owned by the same multi-national that owns Domecq, indeed, the whole thing has recently been purchased by a conglomerate headed up by a Phillipino businessman who is busy buying up large swathes of the town. Raining it may have been, but after the drinks we didn’t care and when we left the bodega the sun had come out too. 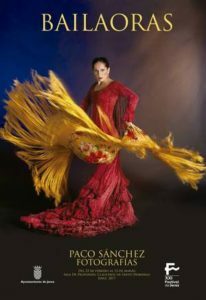 Unfortunately we didn’t then have the time to visit the photographic exhibition by Paco Sanchez of flamenco dancers at the Claustros of Santo Domingo, good though it looked. No, we had to head home to spruce (and sober) ourselves up for that evening’s performance. Brandy Mohito – spanish brandy like Fundador, lemonade, crushed ice, lemon juice and a sprig of mint.